If you ever want to trade or profit from your collectible coins—and I say you should always give yourself at least a chance of doing that—it’s important to have them immediately available. 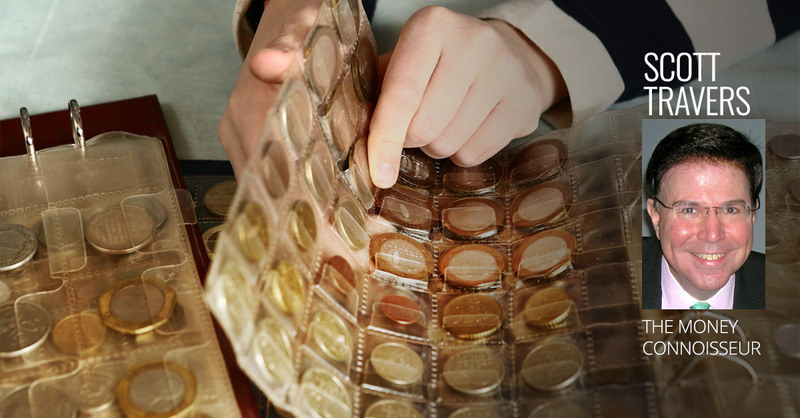 For this and other reasons, it is essential that you always take possession of coins you acquire rather than letting a dealer hold them for you (however safely) in a storage facility or depository. The same goes for owning gold coins for their gold value. In fact, the very purpose of owning physical gold, as opposed to “paper gold” such as GLD, an exchange traded fund (ETF), is not necessarily that it’s the best long-term investment—it’s that in the event you have an immediate demand, the physical gold will be instantly available. Bank safe-deposit boxes are unfortunately becoming a thing of the past. They are, however, among the most practical places to store your coins and metals. But they have their own drawbacks, and a number of caveats apply to your selection of a safe-deposit box. Rare coins should be stored in a cool, dry place—cool because warm temperatures can cause polyvinyl coin storage flips to bleed a damaging, slimy plasticizer, and dry because moisture serves as a catalyst for corrosion. The problem is, many safe-deposit box rooms are designed for the storage of documents that need moisture to keep from turning yellow. Some of these rooms have elaborate systems in place for ozone purification and, yes, for adding moisture to the air. Coin collectors are better served with less expensive facilities that are bone dry. Do not select a safe-deposit box that is in a basement or near the floor of a room. Your preference should be for a higher floor and a higher location within the room for protection against flooding. Obtain a policy that insures the contents of your safe-deposit box, and be certain that it includes coverage for perils such as floods, earthquakes and other natural disasters. Banks generally provide no safe-deposit box insurance, except for possibly covering gross negligence. At least one major bank prohibits storage of cash or coins other than those found to have a collectible value. (Bullion coins made from gold and silver are prohibited.) So, carefully read the safe-deposit box rental agreement. Some insurance carriers will protect you against loss when you carry your coins to and from your bank. Note that a safe-deposit box may not be as available to you as you’d think. A bank closure or branch relocation can affect your safe-deposit box access, as can normal banking hours. Check on your box and its contents regularly; have appropriate additional signers on the box who can facilitate access; and keep its inventory and your receipts for them in separate locations. It’s a good policy to make digital images and videos of your coins and precious metals to help document your holdings and to keep a copy of the images and videos offsite. Privacy advocates make a strong case for bank safe-deposit boxes not being completely confidential. If this is a concern, consult an attorney about what is entailed with forming a legal entity such as a limited liability company (LLC) to hold title to a safe-deposit box. Or better yet: Store your coins at home! If you are comfortable storing coins and metals in your personal residence, your purchase of a home safe is a prudent investment. You should be comfortable storing your coins at home if your insurance carrier covers any loss and makes home coverage available to you at a reasonable price. Your decision in purchasing a home safe should be nearly completely guided by the requirements of your insurance policy. The days of storing gold under the mattress are long gone. In selecting a home safe, you should have an understanding of basic ratings from Underwriters Laboratories (UL) for burglary and fire. TXTL-60X6 is explosion resistant and is tested to withstand break-in attempts of up to an hour on all six sides using commonly available tools. TL-30X6 resists tool attacks for 30 minutes on all 6 sides. TL-30 resists tool attacks against the door and front face for 30 minutes. TL-15 resists tool attacks against the door and front face for 15 minutes. Residential Security Container (RSC) resists tool attacks for 5 to 10 minutes. Victor Gonzalez of Cleland & Associates Insurance, Inc., Dallas, a prominent coin and precious metals insurance brokerage that represents The Travelers, told my seminar audience at the World’s Fair of Money in Philadelphia (Aug. 17, 2018) that in his decades of experience, he has never seen anyone able to penetrate a TL-15 safe even when given much more time than 15 minutes. Gonzalez pointed out that most insurers require that you have a UL-rated home safe as a prerequisite for coin coverage. Check with your insurance company before purchasing a safe, and file any insurance claims in a timely manner. My recommendation is to purchase a safe that is UL-rated against burglary and not pay too much attention to the hoopla that surrounds ratings of water and fire resistance. Most of that hoopla comes from the big-box stores that sell mass-produced, low-priced fire safes that are easily broken into or simply carried away. Most water penetration risk comes from safes stored in the basement. I urge you to locate your safe, if possible, on a high, reinforced floor in your residence. If the floor is not reinforced, the safe is more likely to fall to the basement in the event of a fire. Fire safes derive much of their fire protection from the internal release of moisture, triggered by the heat of a fire, from materials that are sandwiched between their inner and outer walls during manufacture. Even under normal conditions, interiors of fire safes, often designed for gun storage, tend to have high-humidity air inside—often around 50%. Inside temperature is generally maintained at or below 350° during a fire. After the terrorist attacks of 9/11, hurricanes Katrina and Harvey and Superstorm Sandy, hundreds of unidentified safes littered the landscape, and emergency management officials had no way of easily determining ownership. Any home safe should be bolted to the floor, and your name, driver’s license number (not your Social Security number) with the addition of one digit preceded by a dash, and cell phone number should be engraved on multiple sides. [[Many safe dealers offer this service.]] Marking your safe this way will make it easier for officials to locate you for its return in the event of a disaster. There is at least one safe alarm available that I recommend that will send you a text or e-mail whenever there is activity (opening, closing, movement or vibration, or temperature change) relating to your safe. I will explore installation of UL-rated burglar alarms in a future post. From time-to-time we may recommend or promote a product or service from selected companies. In full transparency, please note that we may earn commissions and fees from these referrals.